Good news awaits for all the Android fans. 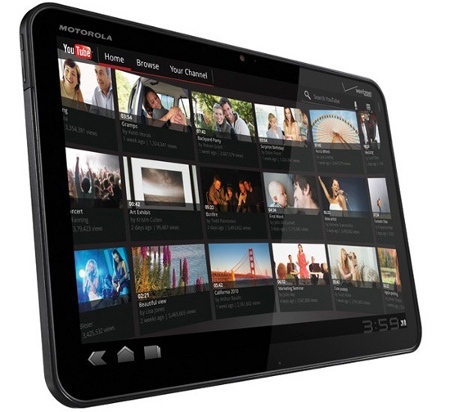 Android 3.0 Honeycomb is officially out today with the launch of Motorola XOOM. This device which some claim to be the iPad killer is now available in the US via Verizon. The tablet will be offered at $599 with a 2 year contract and $799 without contract. Though the claims about this device being an iPad killer can be argued, there’s no doubt that the device will impress many, given the fact that this is the first tablet to launch with Google’s “tablet only OS” Honeycomb. To be honest, the Motorola XOOM doesn’t offer much to be compared to the iPad, with the huge price tag especially. The entry level iPad costs around $499, so there’s no matching the iPad in terms of pricing at least. The XOOM features a 10-inch capacitive screen, 1 GHz dual-core CPU and 1 GB of RAM, which is the same as the yet to be launched RIM PlayBook. And apparently the PlayBook will be priced in competition to the iPad. Which leaves the XOOM over priced. But the Honeycomb factor will surely influence some buyers and eventually make them buy the device. Also there has been some doubts regarding the LTE upgrade, which has now been clarified by the company. It has now been said that in order to get the tablet LTE enabled, the users will have to wait for 90 days after the device is launched, and send the device to Motorola who will make the upgrade for free within 6 business days and the customers will not be required to change their data plans or schemes.